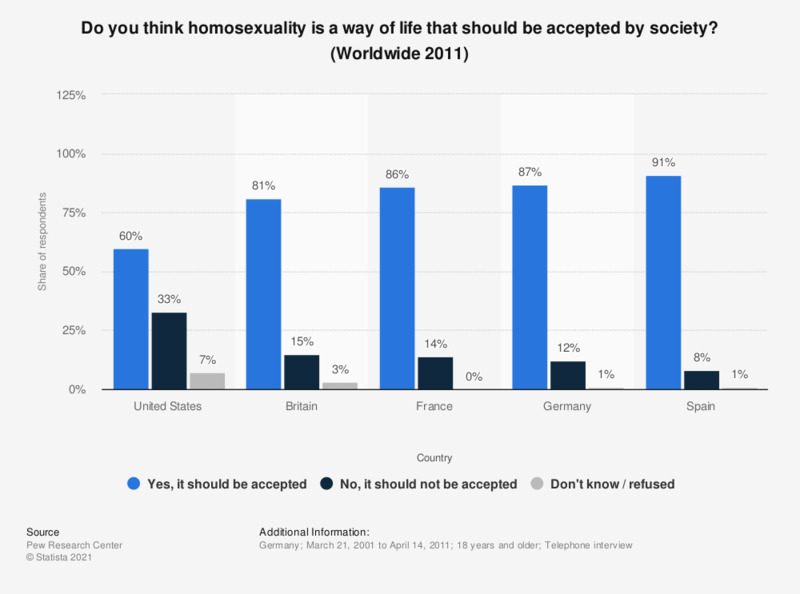 This statistic shows the results of a survey among respondents from selected countries all over the world in 2011 on whether they think that homosexuality is a way of life that should be accepted by society, or not. The survey was conducted in spring 2011. 60 percent of respondents from the United States think that homosexuality is a way of life that should be accepted by society, while 33 percent of American respondents do not agree. The original question was: which one of these comes closer to your opinion, number 1 or number 2? - Number 1: Homosexuality is a way of life that should be accepted by society. – Number 2: Homosexuality is a way of life that should not be accepted by society."